Charles B. French Official Site: How I Met Your Mother: "The Rebound Girl"
How I Met Your Mother: "The Rebound Girl"
Quick Review: An enjoyable episode that ends in a shocking reveal. Spoilers ahead, so watch the episode before you proceed. Seriously, there are some great moments that you don't want ruined, and I'm not kidding about the reveal. Best Episode Moment: James (Wayne Brady) and his family make a surprise appearance. I always love it when he shows up, and his advice to Ted made for a nice, tender scene. Best Character Interaction: Ted and Barney muse about how life would be better if they were gay. Best Line: "Based on all the stuff you've done to them over the years, I don't think you've ever liked them." -Ted summing up Barney's history with women. Best Sagat Narration: "Don't worry, he's going to do something crazy." Best Sight Gag: Marshal's struggle to get a turkey though a doorway prompts Lily to reconsider her decision about an epidural. Most Wasted Opportunity for a Callback: When Robin kept knocking over lamps, why weren't any of them Vikings lamps? Best Cliche Cliffhanger: Robin joining the proud ranks of Temperance Brennen, Grace Adler, Rachel Green, and Murphy Brown. Any hint about The Mother? I'm pretty sure she shares Ted's desire to have kids. Call it a hunch. Any hint about The Wedding? 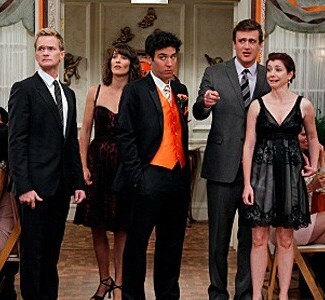 If Barney marries Robin because she's pregnant, then it might be closer than we think. Do we like Ted this episode? Yes, we do like Ted. He went crazy, but for him it was all talk as he's dealing with being single. He didn't actually do anything stupid, and he snapped out of it pretty quickly. No harm, no foul. Overall Opinion of the Episode: This episode had me with Ted and Barney talking about how much better things would be if they were gay. The conversation itself is hilarious, and there's even better subtext. First, Neil Patrick Harris is gay (his partner plays Lily's stalkery ex Scooter). Plus, prior to starring in this show, Harris and Josh Radnor played lovers in a stage play. And then there's Robin's cliffhanger. She's pregnant. We don't know who the father is, as we're saving that bombshell presumably for next week. I fear that the show is setting up Barney as the father, which would be a very contrived way of getting those two together. However, the more interesting choice would be Kevin for the father. Suddenly things get complicated, especially if Robin and Barney wind up together raising another man's baby. The how and why of Barney and Robin getting together then, if that's what's going to happen, would be interesting. Let's talk for a moment about Robin being pregnant. It's an interesting plot development, though not terribly original. However, Robin being anti-baby throughout the series does add a new wrinkle to the trope. While the usual course of events is for a women to not want kids, get pregnant, and fall in love with the baby, that isn't always how things work out. Some mothers, even the good ones, don't have those gooey Mommy feelings that other women get, and the show would be brave to explore that oft-ignored demographic. We already have enough sentimentality with Marshall, Lily, and Ted; I'm not complaining, I love a good dose of sentimentality. However, Robin being a more pragmatic parent, rather then sentimental, would actually be a breath of fresh air. I also would like to see this be the reason that the fabled Wedding happens at the end of this season, because that would mean that the final season of the show deals with what happens after Ted met The Mother. Because otherwise it's a year and a half of watching Ted continue to go crazy being single, and that's going to get very, very old. This Relationship Corner: "Will You Marry Me?" How I Met Your Mother: "Tick, Tick, Tick."